Axel Fischbacher was born in L?beck in 1956. As his father was an IBM manager, from early childhood he lived in various towns and regions of Germany until, at the age of sixteen, he finally moved to the Rhineland. While Axel was still at school, he decided to follow the career of a professional musician. After leaving grammar school with A-Level qualification, Axel went to Spain, where he played in a dance band for six months. But even before his interlude in Spain, he entered the rock, pop and jazz scene and continued to do so after his return from Spain. Amongst others he also played in Bernstein with Kim Merz who later made a name for himself in the cult band Wallenstein. High spot of this early period was the fusion funk jazz project Se?ora. Axel was very successful with this project and took it on various tours. His studies of music took him to different institutes and colleges (Robert Schumann Konservatorium D?sseldorf, Musikhochschule Rheinland Cologne, Banff Center of Arts Canada). His work as a jazz guitar player was deeply shaped in workshops and private tuition by John Scofied and John Abercrombie. 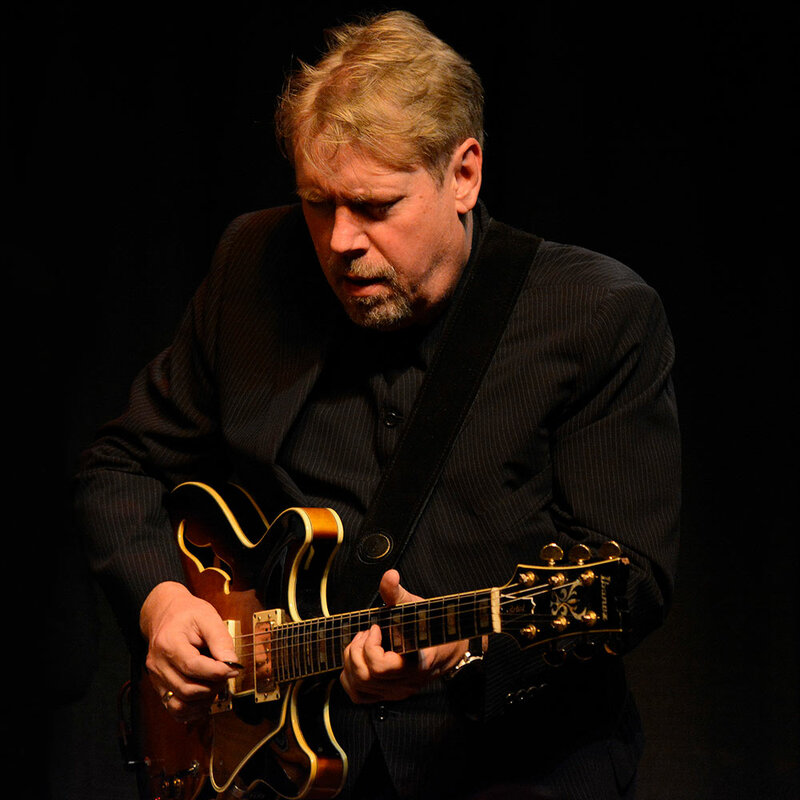 In the eighties Axel entered the European jazz scene playing his guitar in the Christoph Spendel Group, in 1984 he launched his own Axel Fischbacher Group, his 1984 recording Rumba Ibiza being highly decorated (Preis der Deutschen Phono Akademie). In various own projects Axel played alongside Marc Johnson, Adam Nussbaum, Michael Urbaniak, Barney Wilen, Annie Whitehead, Mike Richmond, Ingrid Jensen, Danny Gottlieb, Mark Egan, and Paco Sery. For more than ten years he played in the Daniel K?ffer Quartett. Axel´s work has been rewarded with the WDR Stadtmusik Preis (1987) and the Preis der Deutschen Schallplattenkritik (working as a producer for Norbert Gottschalk). Between 1988 and 1997 Axel lived in Switzerland, first in Basel and then in Bern, where he was head of the guitar department of the Swizz Jazz School from 1992 to 1999. His interest in theatre and film lead Axel to compose and produce film scores for the German television, including the TV series Sekt oder Selters and Tisch und Bett. He also created the music for the television film Wohin gehen wir heute Abend and the short film G?nsehaut, which was awarded with the Price of the Film Festival Lugano. Axel was the musical director at the Staatstheater in Kassel, the Stadttheater D?sseldorf and the Theater in der Josephstadt in Vienna. In the late nineties Axel moved back to the Rhineland and soon released Jazz Attack One alongside his well-established fellow musicians Stefan Rademacher, Kurt Billker and Frank Kirchner. Under the title Jazz Attack Axel also created a successful series of club concerts in the legendary Jazzkeller in Krefeld. Down to the present day jazz fans not only from Krefeld enjoy the fortnightly concerts. In the last couple of years Axel has been focusing on high-quality session music performed in small clubs in front of audiences which can really appreciate this great experience. In addition to Jazz Attack Axel created a similar concert series in Hilden in 2006 called Blue Monday. Likewise Axel makes an appearance within the scope of several new jazz projects. He plays with his fellow guitar players Markus Wienstroer, Philipp van Endert, Sandra Hempel, and Hanno Busch. A remarkable project in 2010 featured Axel not only as guitar player, but also as bandleader and composer. "The World Is Not A Disc" is integrative Jazz music. The band consists of eight musicians (guitar, double bass, trumpet, saxophone, trombone, alporn, sample machine and a total of three drum sets) and plays eight compositions in which Axel stays within his actual musical "playing field" of contemporary Jazz based on improvisation but refers to the music of the Early Baroque composers Häßler, Prätorius and Sweelinck. The occasion of Hilden's Wilhelm Fabry Year brought this project about. The album was co-produced with the Swiss Radio DRS and Jazz editor Peter B?rli. "The World Is Not A Disc" is a considerable festival event. In 2014 the "J?dische Kulturtage im Rheinland" initiated a band project featuring Ohad Talmor. As a band leader Axel produced the CD "Normal" and toured Germany not only in 2014 but also in 2016. 2016 brought the music of legendary Charly "Bird" Parker into focus. With his new quintet Axel recorded "Five Birds", a bebop landmark album. With this album Axel impressively proves how timeless the music of Parker is. The band toured Germany and showed how Axel turned the legendary compositions into swinging, groovy and witty contemporary jazz. Since 2009 Axel has been the musical director of the "Hilden Jazz Workshops" (summerjazz, vocaljazz, crossover bandmeeting, guitar meeting hilden) with prominent international lecturers.